We have now been there on numerous occassions and staff are always quite friendly, along with decent service to boot. With the various dishes I’ve tried, the majority of them would be something I’d go back for. Their Nasi Lemak with Beef Rendang is a good pick. 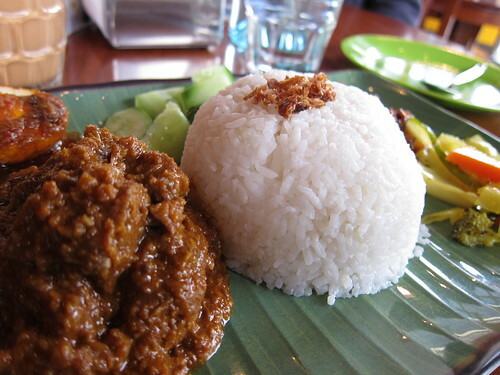 Their Beef Rendang is tender, and you can tell it has been cooked long enough for it to soften. Far too many places that have a Rendang option, serve incredibly tough beef so I was happy that is is one of the few exceptions.The sauce is also quite good, it has a good amount of spice and sweetness but it may be too mild for some people. I’ve had some family friends that have tried this and not really liked it. For me, their Har Mee is also fantastic. It definitely is for those that like a spicier soup. It has all the standard Har Mee ingredients such as boiled egg, prawns, asian vegetables, chicken, fishcake and the two types of noodles. All of it was pretty good, but I’ll admit the prawns lacked any real prawn taste but overall I’d also try it again. 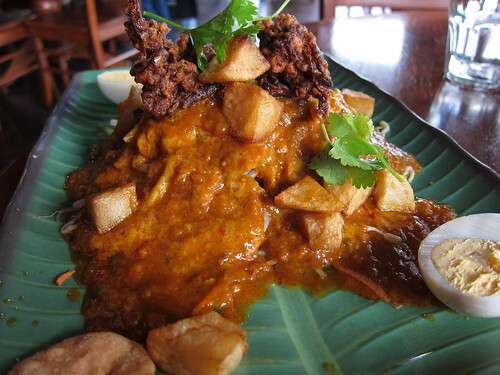 One of the rarer dishes that you’d probably be hard pressed to find in your typical Malaysian restaurant is Pasembor or otherwise known as Indian Rojak. Don’t get confused with their other Rojak as it is worlds apart. Their Pasembor contains fried potatoes, prawn fritters, egg, bean sprouts, cucumber and a warm slightly sweet gravy with a hint of Indian/Malaysian spices. This was the first time I’ve tried this so I can’t gauge it’s authenticity but on taste and flavour? It was good, the sauce was flavoursome, but since I’m not a big fan of bean sprouts either raw or blanched, it isn’t a favourite. What I can say is that my mother (born and raised in Malaysia) had ordered it again on another visit here so that’s a good sign. Lobak! A good one this time. Sometimes I find Malaysian restaurant’s Lobak to be overly dry and lacking in the flavour department too. This on the otherhand was crispy, not too oily, and was cooked well. Plus, the nice sweet chilli sauce gave it the much needed sweetness and slight chilli spice. I can’t recall the name of this Cucur Udang (thanks Adri) but it’s basically prawn fritters and it’s a specialty item that was served during the Muslim month of Ramadhan (thanks again Adri!) and Malaysia Day period. 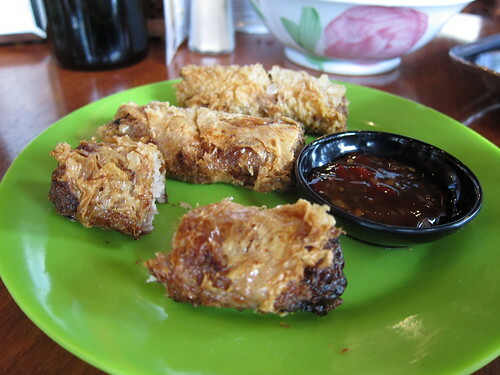 The batter is quite thick and crunchy and is served with a satay sauce. This isn’t one of my favourites, it’s definitely too oily and too thick for my liking. Even the satay sauce was a bit too thick but on the plus side, the prawns were nicely cooked. 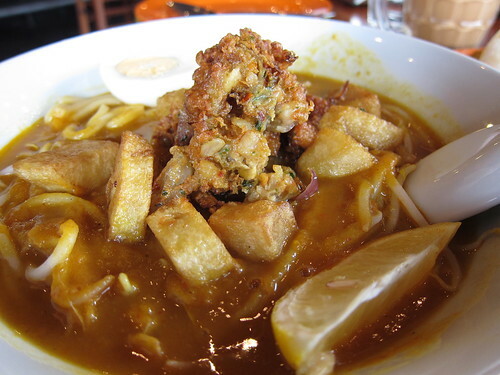 My mother loves Mee Rebus, she used to always go to ABC Cafe in Glen Waverley and order this. 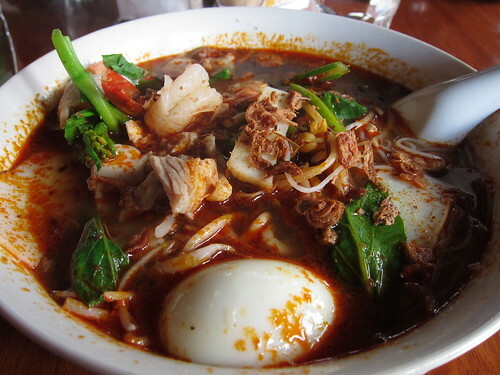 She was saddened to hear that ABC Cafe closed down and so she has been on the lookout for another good Mee Rebus. Their Mee Rebus is different to ABC’s in terms of flavour. There is something with ChilliPadi’s sauce that makes the taste a bit odd, I think it might be too acidic/sour but sweet and packed full of spice so it’s an odd combination. It seems unbalanced but maybe that’s how they do it at ChilliPadi. 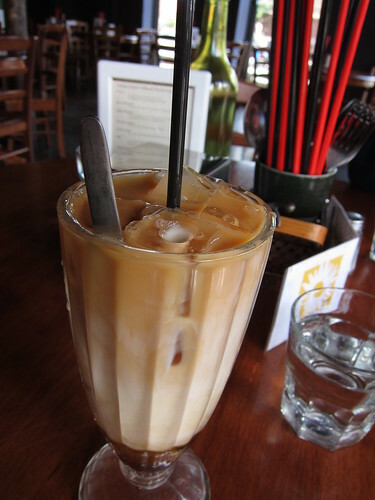 I’ll say I’ve had a taste of a Singaporean restaurant on Lygon St, called Killiney Kopitiam and was surprisingly close to what ABC’s sauce and flavour was like, albeit less thick. Their Nasi Briyani was also only a specialty item for Malaysia Day, and I was amazed at how good it tasted. The flavours just in the rice was fantastic, we’ve been asking them to put it on their menu but at this point it probably will stay a once off kinda thing. This was much better than Taste of Singapore’s offering, and even that was good. 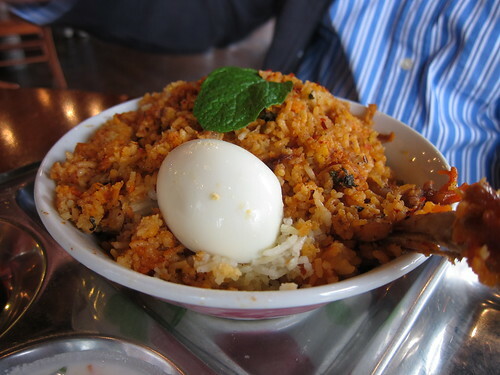 Their Nasi Briyani is very similar to how my mother used to cook it and that’s how I like it! 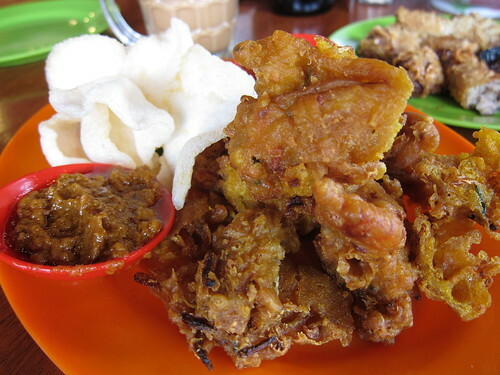 As with most Mamak stores in Malaysia, one of their main specialties is their Nasi Kandar. 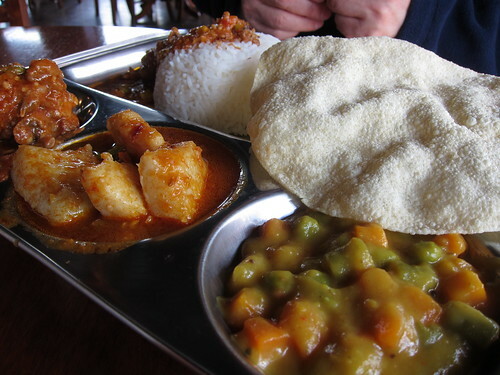 Where you are able to choose your rice, curries, meat and vegetables. 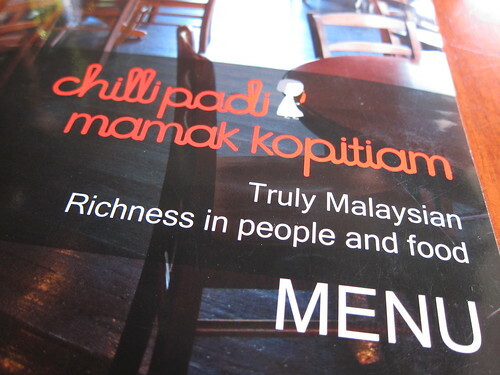 ChilliPadi’s selection is decent, slightly smaller selection to Old Town Kopitiam but decent. You can pick from coconut or plain rice, a sauce of either Lamb Curry, Gulai Ayam or Daging Masak Kicap, and your meat/protein (Beef Rendang, Daging Masak Kicap, Gulai Ayam, Assam Fish Curry, Butter Chicken or Lamb Curry), and one vegetable (Jelatah, Tumeric, Madras or Dhall Masala). I’ve been trying all the Malaysian restaurant’s Teh Tarik and apart from Chilli Mama, there haven’t been any really good ones. ChilliPadi’s Teh Tarik is probably one of the better ones I’ve tasted. It has a stronger tea taste, and it isn’t numbingly sweet, it probably could be less sweet (we add a bit of hot water and it’s perfect) but other then that I can’t really fault it. 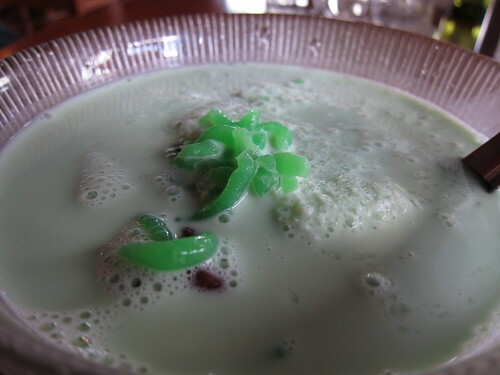 Their Ice Cendol was something I was looking forward to trying, however it left me a tad underwhelmed. As you can see, it’s quite runny and it has nowhere near enough shaved ice. They also added way too much coconut cream/milk and not enough brown sugar so it’s balance is off. Maybe I got them on an off day, I’ll probably try it sometime in the future but not for a while since I was quite disappointed with how it turned out. The three layers drink (Not sure of it’s name three layer tea according to Adri – thanks for the details! ), is very tasty. The layers aren’t as divisive as they are supposed to be but what it lacks in aesthetic value, it provides in great flavour. Be warned as it is indeed for those sweet tooth’s. The syrup layer (palm sugar syrup) at the bottom should probably be stirred until it mixes with the other tea and evaporated milk layer as this is where all the sweetness comes from. 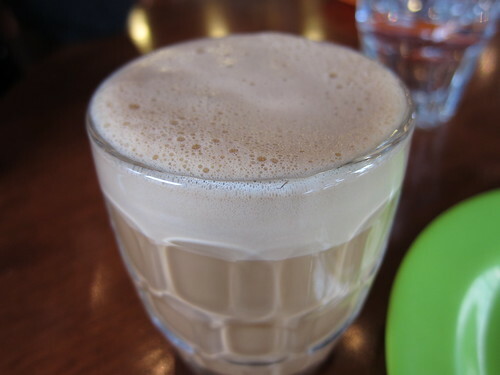 It’s actually quite similar to Teh Tarik in terms of taste. I can’t recall if ChilliPadi serve Bubur Cha Cha on their day-to-day menu but they definitely don’t serve the Burbur Cha Cha with Durian everyday. 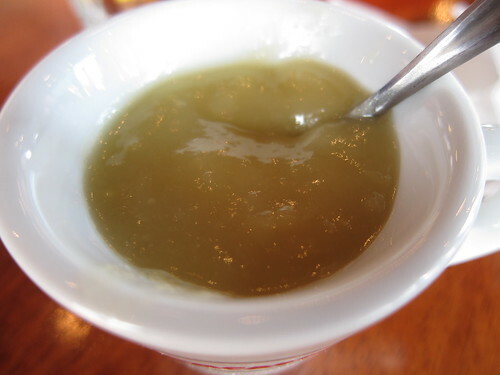 This particular dessert was on their menu during the Malaysia Day festivities and what makes it so different is the Durian paste-like topping. I was pleasantly surprised at how nice their Bubur Cha Cha was. 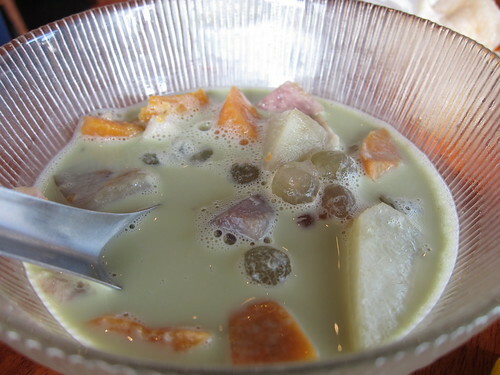 It had all the essentials, diced sweet potatoes, taro and I think yams, with pearls. The warm coconut milk soup was delicious and is probably one of the best offerings I’ve tasted. It even beats some of the restaurants I’ve tried it in, in Malaysia. Only downside would be the diced vegetables are probably slightly too big, I prefer smaller chunks but it doesn’t really take away from the taste all that much. Now, with the added Durian paste, it’s a whole another experience. I’m actually not a fan of Durian at all, it’s taste or it’s infamous odour but because it comes in this paste, the natural smell is non-existant and the Durian flavour is milder. I only added a bit of the paste stirred into my bowl so it was quite subtle but still noticeable. I’ll admit that I was very hesitant at first to try this but I actually didn’t mind it. Would I straight up order this instead of the original Bubur Cha Cha? Probably not, but it wasn’t bad in anyway. For the many locals around Flemington this is a good place to go because it’s Halal, and you don’t see many Malaysian Halal stores around Victoria. ChilliPadi has catered for a different demographic to Chef Lagenda and Laksa King and that’s not a bad thing, we wouldn’t want three of the same stores so close to each other and it’s a welcomed change. My impressions of ChilliPadi on the numerous occasions I’ve been there have been positive. If I had to choose between the three Malaysian restaurants in Flemington, I’d choose ChilliPadi. I’ll reiterate that, if you like more Indian/Malay styled Malaysian food, this is the one to visit so keep that in mind. It offers a great selection of dishes and they aren’t your typical dishes either. If you’re feeling a bit adventurous, give it a try!